Pat Bruce grew up in Belmont, Massachusetts. There were no organized sports for girls when she was in school, so Dr. Bruce participated in what she describes as “apparatus and tumbling”. Dr. Bruce attended Wheaton College in Illinois, where she majored in physical education. She later earned a Master of Education in physical education at Boston University and a P.E.D. in physical education at Indiana University. After listening to Dr. Morrison’s admiration of the Shenandoah Valley and Madison College, Dr. Bruce decided to interview at Madison. “When I interviewed I liked what I saw and heard: energy, enthusiasm, curiosity and committed teachers”, says Dr. Bruce. At Madison College, Dr. Bruce taught swimming, sport psychology, motor learning, and sport sociology in the undergraduate and graduate programs. She also supervised student teachers, advised Zeta Tau Alpha Sorority, and served on many faculty committees. 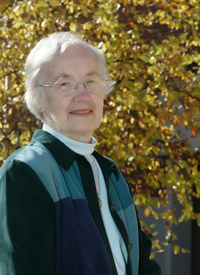 Not only was Dr. Bruce Speaker of the Faculty Senate for two years, but along with other women, Dr. Bruce helped to found the Faculty Women’s Caucus and served as the President. Dr. Bruce was active in many professional organizations, including: Vice President of the Southern Association of Physical Education for College Women; American Alliance for Health, Physical Education, and Recreation; and President of the Virginia Association for Health, Physical Education, and Recreation (VAHPER). Dr. Bruce was awarded both the VAHPER Honor Award and the Pioneer Award in recognition of her outstanding service and leadership to VAHPER and the profession. Dr. Bruce was a coach as well as a leader and teacher. She coached field hockey, basketball, volleyball, and softball at the high school level and basketball and tennis at the collegiate level. Dr. Bruce also coached the Madison swim team for one year and directed the Porpoise Club (synchronized swimming) for several years. When asked about JMU, Dr. Bruce believed that Madison College had and continues to have strong academic programs. It also teaches its students to volunteer and give their time and talents to other people. According to Dr. Bruce, the Center is important because there is a need for activity programs for girls and women who are not necessarily elite athletes. “Be active physically, mentally, socially and spiritually, whether you are in a formal program or not all of your life,” Dr. Bruce said to all girls and women.